At 2018 WWDC, Apple officially announced that macOS Mojave is the last version of maOS to support 32-bit apps. Though 32-bit apps can run on macOS High Sierra, you would constantly receive the warnning to let you update apps or optimize apps to improve compatibility. So far, it's unclear what you'll be asked to do if 32-bit apps work on your macOS Mojave computer. But what is confirmed is that 32-bit apps are entirely excluded starting with the next year's macOS release. Among your varied macOS apps, DVD ripper might be your most concern, for majority of DVD copy programs are 32-bit apps. Fortunately, after a lot of searches and test I have done, I find that there are still some 64-bit DVD ripping programs that can rip and copy DVD on macOS Mojave or later perfectly without update or optimization requirements. MacX DVD Ripper Pro is just one of them. 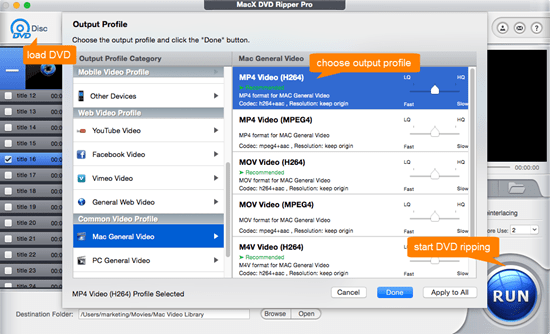 MacX DVD Ripper Pro, the cutting-edge 64-bit DVD decrypter and ripper, allows you to remove DVD DRM and copy DVD movies to MP4, HEVC, H264, MOV, AVI, MKV, VOB as well as rip DVD to iPhone X/8/7, iPad, Android, etc. mobile devices seamlessly on Mac OS X 10.6 to macOS Mojave or later. It accepts whatever you feed it: 99-title DVDs, oversized 75GB DVDs, Lionsgate protected DVD, workout DVDs, damaged/unplayable DVDs, etc. and makes a 1:1 backup of DVD in MPEG-2 format or ISO image for later DVD burning. What makes this tool stand out from the crowd is that it can decrypt and rip DVD movies on macOS Mojave at Intel/Nvidia/AMD GPU hardware accelerated speed, 5X faster than any other software. Free download this 64-bit DVD ripper for Mac or Windows PC. Afterwards, fire it up on your computer. If you need to copy DVD disc to macOS, prepare an external DVD driver or Apple USB SuperDrive to insert your DVD disc. 3 ways are available for you to import DVD source, including DVD Disc, VIDEO_TS Folder, or ISO image. Step 2: Choose An Output Profile. Select the output formats or profiles you desired to rip DVD to. 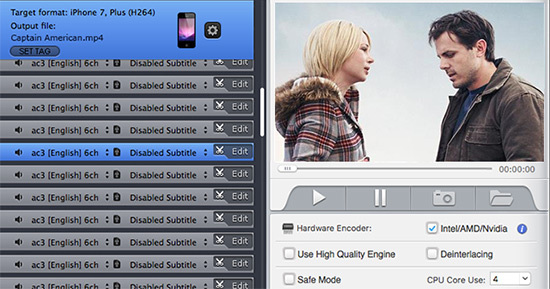 With 350+ preset profiles, you're able to convert DVD to iPhone iPad Android mobiles with HEVC, H264, MP4, MOV formats or backup DVD movies to USB Drive, NAS, SD Card, Media Server etc. Press "RUN" button to start to digitize DVD on macOS Mojave without compatibility trouble. The whole DVD ripping process will be finished at GPU hardware accelerated 5X faster speed if your Mac supports it. Note 1: at the lower right corner of the home screen, there is a hardware encoder, which will be automatically selected if your MacBook/iMac/iMac Pro supports Intel QSV, Nvidia or AMD GPU hardware acceleration tech. Check the entry-level requirements on hardware configurations of GPU HW acceleration to see if your desktop meets the demands. Note 2: to rip and copy latest DVD movies, you'd better manually tick "Safe Mode", which ensures you a smooth DVD decryption and DVD backup process without DVD ripper half crash or unable to read a disc problems. Note 3: quality matters a lot. Tick "Use High Quality Engine" and "Deinterlacing" options to improve output quality to the maxium degree. To rip commercial & homemade DVDs to MP4, MOV, H264, HEVC x265, MKV, MPEG-2, VOB, ISO image as well as copy DVD to iPhone iPad Android, game consoles without macOS compatibility problem. High Quality Engine guarantees you 98% quality reserved and Intel/Nvidia/AMD hardware encoder ensures you 5X faster speed to finish 90-min full DVD ripping task at 15-20 minutes. Find the Best Free DVD Converter Software for macOS? Complete List of best DVD ripper for macOS and Windows.